The United States Department of Agriculture (USDA) announced its intention to provide a loan guarantee to a commercial biorefinery using Coskata Inc’s proprietary technology. The Coskata plant will be the largest-planned cellulosic biofuel facility in the United States. The project financing mechanism, defined by the U.S. Department of Agriculture’s 9003 Biorefinery Loan Guarantee Program, will be the largest ever awarded for a biofuel facility. It will allow the Coskata supported facility to move forward with financing the construction of a 55 million gallon per year cellulosic ethanol facility in Greene County, Alabama. Coskata has been demonstrating the commercial viability of its process for over a year at the company’s integrated biorefinery, located in Madison, Pennsylvania. This will be the largest-planned cellulosic biofuel facility in the United States. Per its website, Coskata is a biology-based renewable energy company whose low-cost platform technology allows for the production of fuels and chemicals from a variety of input material (including biomass, agricultural and municipal wastes, and other carbonaceous material). Using proprietary microorganisms and patented bioreactor designs, Coskata is ready today to produce FlexEthanol™, or feedstock flexible ethanol, to fuel energy security, economic growth, and environmental sustainability. Per its own website, Coskata's proprietary microorganisms eliminate the need for costly enzymatic pretreatments, and the bio-fermentation occurs at low pressures and temperatures, reducing operational costs. In addition, the Coskata process has the potential to yield over 100 gallons of ethanol per ton of dry carbonaceous input material, reducing both operational and capital costs. Coskata's exclusively licensed separation technology has the potential to dramatically improve the separations and recovery component of ethanol production. Coskata is privately held, and to date has been funded entirely by its equity investors, including Khosla Ventures, Blackstone Cleantech Ventures and the Blackstone Group, Advanced Technology Ventures, GreatPoint Ventures, Total Energy Ventures International (part of Total, one of the world’s major Oil and Gas groups, and a top tier player in chemicals), Coghill Capital Management, General Motors, and Globespan Capital Partners. 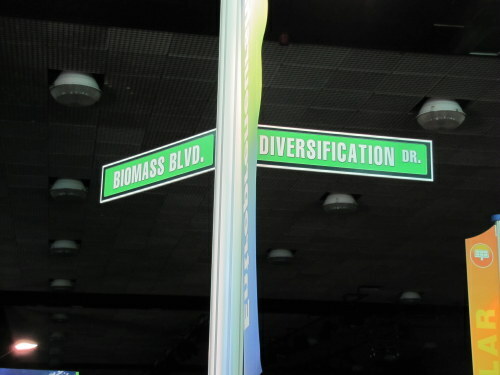 According to media.gm.com, General Motors has been an investor in Coskata since 2008, and is specifically helping the renewable-fuel developer speed commercialization of its unique process for turning biomass into transportation fuel. For the record, it’s also great news for General Motors. After all, GM has more than 5 million flex-fuel vehicles, including an industry-leading 19 current models, on the road. GM believes E85 ethanol, particularly when made from biomass, is the most effective near-term solution to reduce petroleum dependence and CO2 pollution. Although committed to the electrification of the automobile, GM realizes the internal combustion engine is not going away overnight. So, it is also committed to bio-fuels. Still, some auto analysts still wonder why GM isn’t more committed to natural gas which is plentiful and growing as a fuel. At the 2011 Detroit auto Show, only Honda showed natural gas as viable option for the public; and Ford recently announced nat-gas for its Transit Connect Taxis.